Heartlands WA promotes opportunities, employment prospects, infrastructure benefits, community connectedness, lifestyle choices, land package varieties, business and industry developmental possibilities, social service facilities including education and health, tourism and a vast array of products, services, events, festivals, food and wine. Their new website features a range of advanced functionality which allows them to focus more on running and growing their organisations; rather than on managing their website because a lot of the manual processes from their former website are now automated. For example, Heartlands WA is an organisation that offers a number of different membership levels to the businesses and individuals. These memberships were managed in an excel spreadsheet and renewal notices were issued manually every year. This process has been automated through their new website and members now receive an email notification when their membership is about to expire. A member can use My Account to login, view their membership and renew their membership online with both PayPal and Offline Payment methods available. Once a member renews their membership Heartlands WA receives a membership renewal notice and can approve or deny the membership. Once the membership is renewed the member can continue to use their account and the benefits of their membership. Discounted classified listings: the member can login to their account and receive their discount automatically including free classified listings and a certain percentage off classified listings. This allows them to post job, property and investment listings at discounted rated compared to non-members. Membership listing: Each member can list their business in a membership listing section of the website. My Account allows members to submit and edit their own membership listing whenever they want without having to contact Heartlands WA staff to do it for them. This empowers users and reduces the amount of time staff spend maintaining the website. 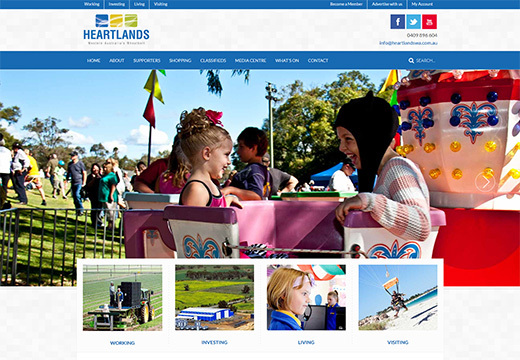 Submit events: The Heartlands WA website features a Calendar of Events, through My Account both members and non-members can submit events to this calendar which are then moderated by the staff at Heartlands WA before being published. Users can edit and delete the events they submit anytime they like. The Heartlands WA website features functionality that automates a majority many business processes that used to be manual. This allows them to focus on bigger and better things for the Wheatbelt community rather than having their time eaten up in day-to-day processes.